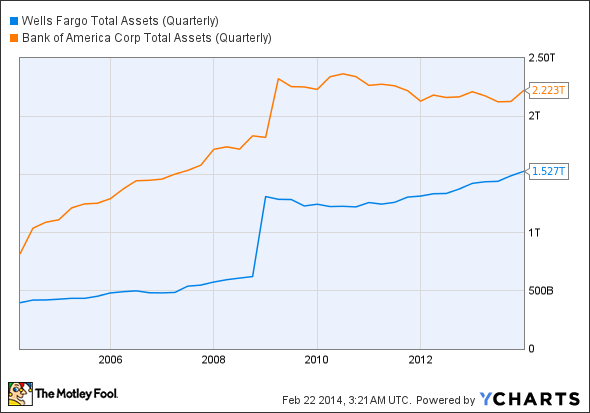 These two banking giants are very different breeds of investments. Here are the main differences and what it could mean for your investing returns. When it comes to bank stocks, there is an incredible range of companies to choose from, whether you're looking by size, risk, dividend yield, or something else. In other words, not all banks are created equal. With that in mind, I'd like to take a look at two of my favorites, Bank of America (NYSE:BAC) and Wells Fargo (NYSE:WFC). To the average consumer, these two banks may seem very similar; however, as an investor, you need to be aware of the distinct advantages and disadvantages based on your risk tolerance. What is the credit quality of the bank's loan portfolio? How many "legacy assets" (which is the banking world's way of saying "pre-financial crisis junk") are still on the balance sheet? It's not even close here, although this may change over the next several years. Bank of America pays a minuscule yield of just 0.25% annually, due to the government's need to approve the company's capital plans. In addition, its overall strength isn't quite where it needs to be, although it is much improved from where it was a few years ago. Wells Fargo, on the other hand, has impressed the government, allowing it to raise its quarterly dividend from just $0.05 in 2011 to the current payout of $0.30, which translates to a yield of about 2.6%. For those who want income from their holdings, it's a no-brainer here. Both companies have grown significantly in recent history, due to major acquisitions and growth in their own operations. The total assets of both companies spiked in 2009 as a result of the acquisitions of failing competitors such as Wachovia (to Wells), Countrywide, and Merrill Lynch (to B of A). Other than crisis acquisitions, Bank of America did the better job of growing before 2009, but Wells Fargo has done much better in expanding its operations and portfolio since then. Its assets have grown by around 12% during the post-crisis years, while Bank of America's have actually dropped a bit (although a lot of this is to blame on B of A shedding a lot of bad assets). Wells Fargo has done an excellent job of growing its core businesses, and has mostly stayed away from risky activities. For example, in 2013 Wells originated almost 20% of all U.S. mortgages -- double that of its nearest competitor. 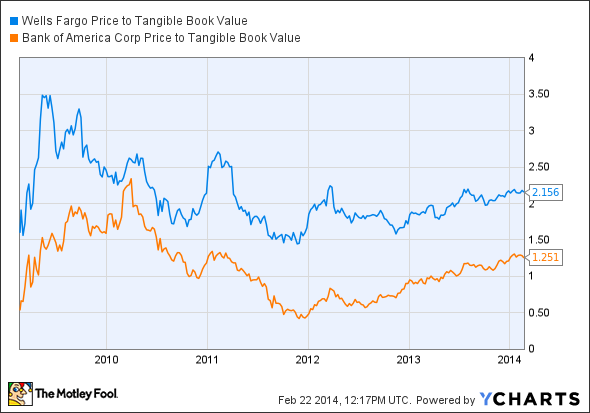 To sum it up, Bank of America is by far the "cheaper" company in terms of how low the share price is relative to the tangible book value, but that doesn't really tell the whole story. In order to really make a judgment here, you need to compare the valuation to the risks involved and the quality of each bank's assets. Additionally, Bank of America has been and continues to be the target of lots of legal action resulting from the financial crisis. While the company has settled most of the outstanding claims against it, legal expenses are still a drag on B of A's bottom line, costing $2.3 billion in the fourth quarter of 2013 alone. As with most other investments, the higher the risk, the higher the potential reward. Bank of America certainly has the potential to deliver higher returns to its shareholders should everything go according to plan over the next few years. Wells Fargo's business is the most solid among the big banks, which naturally leaves it less room to improve, but makes for a safer investment. A final thought on valuation and potential: Wells Fargo has a market cap of $240 billion, which represents about 16% of the company's $1.5 trillion in total assets. In comparison, Bank of America is valued at around 8% of its $2.2 trillion in assets, which should give you an idea of the market's perceived risk involved with the company. However, if those risks were to be eliminated (legacy assets, end of litigation, improvement in quality of assets), it is conceivable that Bank of America could be valued much more favorably. For those willing to take a chance, you could indeed be very handsomely rewarded down the line. Wells Fargo is certainly the safer bet, but as far as the long-term is concerned, Bank of America has a risk/reward ratio that is hard to ignore.